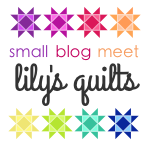 This is my first time entering the Bloggers Quilt Festival organised by the lovely Amy. If you’ve not heard about the festival head over now and learn all about it, or even better enter a quilt! 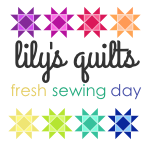 If you’re a regular reader of my blog you probably already know that I hold a sewing group once a week at my house. If you’re new to my blog hi and thanks for popping over! We called our group The Ladies Wot Stitch and we’ve been meeting up for over a year now. We all like different crafts, some of us sew, some crochet or knit but we all really enjoy each others company. Earlier this month one of our group, Natalie, got married. Her and her husband had a beautiful ceremony in Cyprus, then last Saturday they had a lovely reception party locally for us all to celebrate with them. As a wedding gift the rest of The Ladies Wot Stitch and I decided to make them a Wedding Quilt. We opted for a turquoise, white and grey colour scheme and I came up with a simple heart themed pattern. Not all of the ladies have made quilts before, or even used a sewing machine, so I tried to keep it quite straight forward for all levels. For the centre of the quilt my clever mum, Julie, cross stitched their name and the date they got married. We all wanted to incorporate some cross stitch into the quilt as Natalie always has a cross stitch project on the go and she is forever telling us how much her husband moans about the amount of cross stitch they have in the house. We just knew it would put a smile on her face! To stabilise the fabric to enable my mum to cross stitch onto the quilting cotton she used some dissolvable Aida. She said it was great, once you have finished your work you simply soak it and tease the dissolving Aida away. I plan on giving it a go on a future project as I really liked the look of the finished block. We were all really happy with the finished quilt. I love how everyone’s personality comes across in their block. It’s funny how when a group of people are given the same set of instructions how they interpret it, how different we all see colours and patterns. For the back we chose Robert Kaufman Spot On wide quilt backing in Steel. I decided to keep the quilting light as I didn’t want to take away from everyone’s hard work. We gave Natalie the quilt at the reception party. I think her expression says it all. This might not be the most complicated quilt but I really enjoyed making it and I think it was just right for the occasion. I’m so proud of our group, especially the members who had never attempted patchwork before and I think that the quilt sums up our friendships perfectly. Recently it was the hubby’s birthday and being the super wife that I am I decided he needed a break. I arranged for my amazing mum and dad to have the monsters, dropped the dogs off at the kennels and took him to Berlin for the weekend. Now you can imagine how many super wife points I racked up for a monster free weekend in a swanky hotel in a country that loves beer. We weren’t really sure what to expect of Berlin, so we went with an open mind. We were totally overwhelmed by how beautiful it was. Both Sean and I instantly fell in love with the city, how open and green it was, the architecture, the history and of course the food and beer! We didn’t manage to see anywhere near as much as we wanted to but we gave it a good go. We stayed in the East of the city. It was a really lucky choice, to be honest I didn’t really have a clue where would be best to stay, but as it turned out we were within walking distance of nearly all the sites we wanted to visit. I can’t really explain how much of an amazing time we had, we both completely fell in love with Berlin. We plan on visiting again soon, next time with the boys as we didn’t manage to see much of the West so would like to spend time exploring and visit the zoo. Since we’ve been back I’ve been busy working on secret projects and Christmas gifts so I can’t share those with you yet, but before we went away I did manage to squeeze in a selfish crochet project. I made myself a scarf to take away, I decided on this Elise Shawl pattern that an Instagram friend had recommended (you can find it on Ravelry). It’s the first larger crochet project I’ve attempted and I found the pattern pretty easy to follow. I even blocked it which was a first for me too! I opted for a sock yarn in pinks and purples as I wanted to keep it light to wear through autumn. I’m already planning a second in a heavier yarn for winter but I really have to get on with my Christmas projects before anything else!